From left to right: Jason Honigfeld and Chuck Pagnotta; Alison Fournier and Rita Soronen (The Dave Thomas Foundation for Adoption); Brad Honigfeld, Dave Cahill, Rick Barbrick and Jordyn Honigfeld from The Briad Group at the organization’s 20th Annual Charity Golf Outing. COLUMBUS, Ohio, September 20, 2018 /3BL Media/ — At its annual Charity Golf Outing in Somerset, NJ last week, The Briad Group® presented the Dave Thomas Foundation for Adoption with a check for $425,000 and pledged additional contributions toward the Foundation’s commitment to dramatically increase the number of adoptions from foster care. 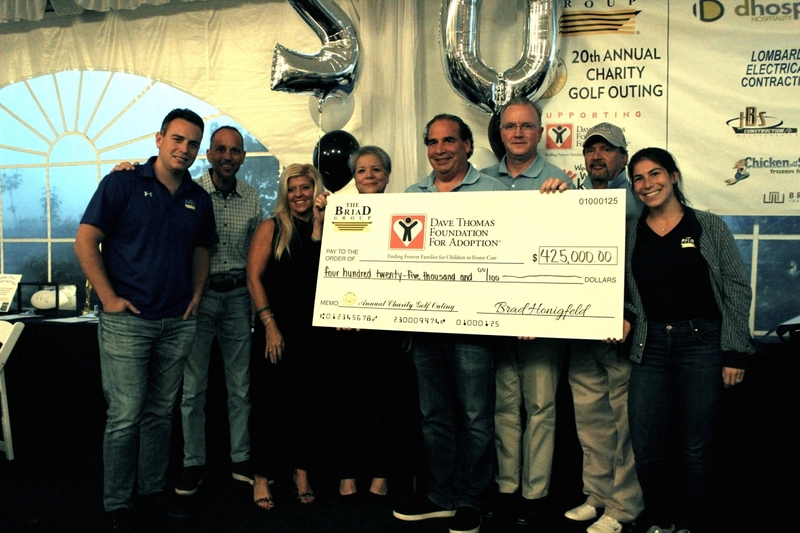 With Dave Thomas’ value of giving back at its core, The Briad Group and its partners, employees and sponsors have raised more than $5 million to advance the Foundation’s mission over the last 20 years. Through the generosity of The Briad Group, the Foundation is making significant progress in scaling its Wendy’s Wonderful Kids program across the United States and Canada. This evidence-based program is up to three times more effective in finding adoptive families for children who have been waiting in foster care the longest. To date, nearly 8,000 children have been adopted as a direct result of Wendy’s Wonderful Kids, including nearly 500 children in New Jersey, New York and Pennsylvania, where The Briad Group operates. “Our mission is to ‘create lifelong relationships with our teammates and guests,’ and certainly that includes the entire Wendy’s family as well as our wonderful business partners and friends,” Barbrick added. The Dave Thomas Foundation for Adoption is a national nonprofit public charity dedicated exclusively to finding permanent homes for the more than 150,000 children waiting in North America’s foster care systems. Created by Wendy’s® founder Dave Thomas who was adopted, the Foundation implements evidence-based, results-driven national service programs, foster care adoption awareness campaigns and innovative grantmaking. To learn more, visit davethomasfoundation.org.